financial advisors • Max Blog • Max. your best interest. What’s Better for Clients Than Money Markets? Max. This week, Max is at the T3 conference in Orange County, Ca., which is spurring us to think about financial advisors and how we can help them best serve their clients. As financial advisors think about where to put their clients’ cash, many head automatically toward money market funds. But in today’s regulatory environment, where money market funds pay ultra-low rates and can force investors to pay redemption penalties in times of market turmoil, they may no longer be the best choice. There is a better solution for cash held in brokerage or bank accounts. It’s called Max. Some statistics about cash: high-net-worth households in the U.S. are currently holding 23.7% of their assets in cash. That works out to a staggering $3.5 trillion, just among the top 4% of the U.S. population. Most of this cash is being kept in the wrong place. In money market funds, it is under-earning its potential and it’s not insured. Clients hold cash for a host of reasons, including as a reserve for a future real estate purchase, private equity capital call, or other asset buy. A recent U.S. Trust survey showed that a majority of clients were holding cash on the sidelines to serve as “dry powder” to capitalize on market opportunities. That’s the same reason why Warren Buffett has said he likes cash so much. Most financial advisors think that clients aren’t holding much cash because what they see is the cash allocation within the client’s investment portfolio. The reality is that there’s a lot more cash sitting on the sidelines, out of view of the advisor. Most high net worth investors maintain multiple advisory relationships at several institutions. Advisors’ wallet share is only what clients choose to bring to them. Where is this cash being held? Up until this point, the default for many financial advisors was to keep client cash in a money market fund. This is no longer best practice, especially in a fiduciary environment. It’s difficult to justify offering your clients less of a yield on uninsured cash when there’s a solution that allows them to earn more and stay FDIC-insured. After the 2008 financial crisis, the SEC imposed new rules on money market funds, rendering them no longer a true cash equivalent. Under the new regulations, retail-held prime funds are subject to redemption gates of up to 10 days and redemption penalties of 1-2% in periods of financial stress. This means that your clients may not be able to access their funds when they need them most. At the same time, yields on money markets are still relatively low, and these funds are not insured. How can Max solve these problems? Max offers a tool that lets advisors bring more cash into view, help clients earn more on that cash, and help ensure that cash is fully insured. We’ve created a better solution for cash, offering liquidity, higher yield, and greater FDIC insurance. Max doesn’t take custody of clients’ funds. Their cash stays in the client’s own name, while our software acts as a sort of air traffic control system, telling the banks to move funds among the client’s own accounts whenever it’s advantageous to do so to get better rates. In this manner, clients continuously earn the highest yield possible within the FDIC limits. That means Max members can keep up to $5 million per couple insured, and we have a partner solution that can deliver up to $50 million of FDIC coverage per tax ID for business accounts or complex trusts. Now that money markets are considerably less attractive, isn’t it time to find a better way to manage cash? Learn more about Max at MaxForAdvisors.com. Max solves the liquidity problem that money market funds suffer under new rules taking effect in October 2016. CEO Gary Zimmerman explains in this video. Money market funds once were considered equivalent to cash. No longer. Under new rules that take effect October 14, 2016, money market funds may not be liquid in periods of market stress, meaning you may not be able to access your cash when you need it most. These changes will also affect how investors and their financial advisors think about money market funds in their portfolios. The advantage of a money market fund was that shares of these funds behaved like cash. Their value held steady at one dollar per share and investors could buy and sell them at any point. Money market funds were viewed as a safe place to park cash, while earning slightly higher returns than a bank account. The 2008 global financial crisis showed that these funds may not always be safe. When the Reserve Primary fund “broke the buck,” watching its shares dip below $1 for the first time, it sparked investors’ fears that their cash held in money market funds might not retain its value. The funds weren’t really cash after all. The main effect of the new rules on individuals will be to allow money market funds to limit investor redemptions in the event of extreme market volatility, and to impose fees on redemptions in such cases. Investors who wish to sell their shares when the markets are turbulent may not be able to do so, as these funds can impose gates on redemption for 10 days. Investors may also have to pay a fee to redeem their shares too. If it costs extra to get your money back, and the funds can wait 10 days to return your cash to you, is a money market fund still the same as cash? Many investors and their financial advisors don’t think so. They are increasingly looking at higher-yielding, FDIC-insured savings accounts at online banks as a place to put cash to keep it safe and fully liquid. Max can solve this problem. As an intelligent cash management service, Max automatically allocates investors’ cash between their existing checking or brokerage account and a portfolio of higher-yielding FDIC-insured savings accounts at the nation’s leading online banks. Most Max clients are earning more than 1.00% on their cash, with full FDIC insurance of up to $1.25 million per individual or $5 million per couple. By contrast, many bank or brokerage accounts pay only 0.01% or 0.02%. Max is not a bank, nor does it provide financial advice. Max is a technology-driven tool that automatically helps clients spread their cash among higher-yielding online savings that they hold in their own name. Clients retain direct access to their funds, maintain their relationship with their primary checking-account bank or brokerage firm, and can continue to use all bank services like notaries and tellers. And, unlike money market funds under the new regulations, there are no gates to redemption, and no extra fees to withdraw money. In addition to delivering a higher-yielding solution to clients, financial advisors can bring more cash into view, fostering more holistic asset allocation discussions and growing AUM. Learn more about the Max Advisor Dashboard and how to get started with Max by visiting MaxForAdvisors.com. Or contact advisors@maxmyinterest.com with questions. Max brings more cash into view. After eight years of near-zero yields, clients are eager to earn higher returns. Financial advisors want to deliver greater returns without taking on more risk. Advisors are using a novel technology, called Max, to achieve both of these goals, helping clients earn more while growing assets under management. Which asset class can generate an incremental 0.90% of return, without taking on risk or sacrificing liquidity? The answer lies in a forgotten corner of client portfolios: cash. Most investors are earning little to no interest on their cash held in their bank or brokerage accounts. Since yields have been so low for so long, most financial advisors don’t spend much time thinking about cash. Instead they focus on higher-return asset classes like stocks, fixed income, or alternative investments. But how much clients earn on cash can make a significant difference to the overall performance of their portfolios. Here’s the math: the average high-net-worth investor holds 23.7% of his or her net worth in cash, according to the 2015 CapGemini/RBC Wealth Report. Earning an extra 0.90% on that cash means the portfolio as a whole will earn 0.21% more. Because it’s cash in the bank — FDIC-insured — this incremental return is risk-free. Max is an intelligent cash management service that automatically allocates clients’ cash between their existing checking or brokerage account and a portfolio of higher-yielding FDIC-insured savings accounts at the nation’s leading online banks. Most Max clients are earning more than 1.00%. By contrast, many bank or brokerage accounts pay only 0.01% or 0.02%. How does Max help clients earn more on cash? By capitalizing on the efficiency of online banks. These institutions don’t have branches, and their lower cost structure allows them to pass along more yield to clients who deposit cash with them. For financial advisors, offering Max to clients has the effect of bringing held-away cash into view. Over time, clients migrate cash towards Max, where they can grant their financial advisor read-only access to their balances through the Max Advisor Dashboard (a free service for financial advisors.) With the ability to see the cash that clients are holding, advisors can spark a new conversation about portfolio allocation, and often nudge some of this cash into higher-beta asset classes. Max is not a bank, nor does it provide financial advice. Max is a technology-driven tool that automatically optimizes a client’s cash balances among accounts at online banks held in the client’s own name. Clients retain direct access to their funds, maintain their relationship with their primary checking-account bank, and can continue to use all bank services like notaries and tellers. Learn more about the Max Advisor Dashboard and how to invite clients to Max by visiting MaxForAdvisors.com. Or contact advisors@maxmyinterest.com with questions. 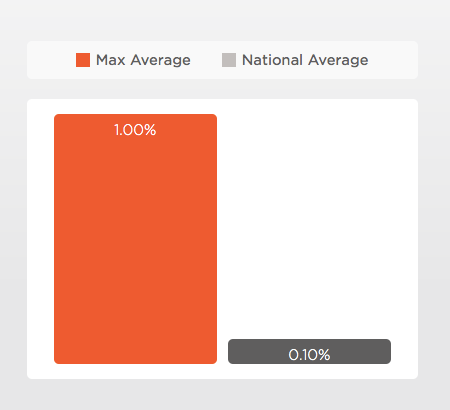 Max members are earning about 10 times more on their cash than the national average. With the move towards the fiduciary standard across the investment-management landscape, financial advisors increasingly are looking at how they can make sure their clients are getting this standard of advice for the cash portion of their portfolios as well as for their securities. That’s where Max comes in. Cash is the one asset class that’s present in every portfolio. But a near-zero-interest-rate environment over the last few years has meant that investors overwhelmingly are earning almost nothing on cash. The national average on savings accounts is 11 basis points — 0.11%. As a fiduciary, an advisor is bound to give advice that’s in a client’s best interest financially. For cash, this means advisors have to seek out ways that clients can earn more interest while remaining insured under the FDIC deposit guarantees. Money market funds are a traditional substitute for cash, because they’re designed always to trade at a stable $1 per share. But with new regulations, these funds may now be able to hold onto investors’ money if markets are in turmoil. That means that clients may not be able to get their money out of a money market fund when they need it most. With this lower level of safety, and essentially no yield, money market funds may not be up to the fiduciary standard as a cash equivalent. Online banks don’t have branches, so their cost structure is considerably less than their brick-and-mortar competitors. This imbalance allows them to offer higher interest rates to depositors — above 1%, in some cases, making online banks the highest-yielding places to park cash that clients wish to keep fully liquid. FDIC-insured online banks have the same federal deposit guarantee as any other U.S. bank protected under the program. Many investors don’t realize that exceeding the FDIC limits in their accounts means that excess money may not be safe if something happens to the bank. If your clients hold more cash than the FDIC limit — $250,000 per depositor, per account type, per institution — you should consider helping them open accounts at additional banks to gain FDIC coverage for as much of their cash as possible. Keeping cash safe is a prerequisite for fiduciaries. It’s possible to get both higher interest on cash and greater FDIC coverage. That’s what Max provides for advisors and their clients through the Max Advisor Dashboard. The average Max client is currently earning more than 1.00% on cash and enjoying FDIC coverage across several institutions. Learn more about how you and your clients can benefit at MaxForAdvisors.com. For financial advisors, cash is often the forgotten asset class. High net worth households are holding about one-quarter of their assets in cash. But financial advisors say their clients have 10% of their portfolios in cash. These are the same investors; why the discrepancy? Financial advisors are charged with managing their clients’ investment portfolios. That includes stocks, bonds, and other asset classes — but it frequently excludes cash. That’s because investors often hold cash across multiple institutions — in their checking account, brokerage account, and perhaps other banks as well — and may only tell their advisor about the portion of their cash they intend to use for investments. They may not realize that they could be earning significantly more on this cash, or that they should be apportioning it to take full advantage of FDIC insurance. 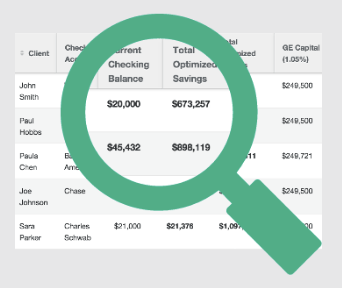 With the new Max Advisor Dashboard, when an advisor’s clients become Max members, it’s now possible for the advisor to see all client cash holdings in one view. This is good for both the advisor and the client. The client gets all the benefits that come with Max membership, starting with more yield on cash: currently about 1%, or 10 times as much as the national average. Max automatically optimizes accounts for FDIC coverage, and makes sure members always are earning the maximum interest possible across their accounts. The client can optimize accounts on demand, instruct money to move from checking to savings and back, and receive one file with all their 1099-INT tax reports. For the advisor, the benefit is in being able to offer clients a higher yield on cash than the current rate offered at most institutions. Gaining a view of clients’ cash held in different accounts means that advisors know what funds are sitting on the sidelines in case investment opportunities come up. And advisors can now have a conversation with clients about what the cash is for, and how to make the best of it. Clients can grant their advisors read-only access to their Max account simply by adding their advisor’s email to their Profile page. 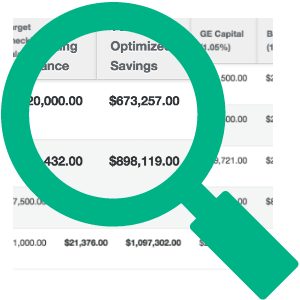 In addition to gaining visibility over client cash balances, advisors will find additional materials on the Max Advisor Dashboard, including setup guides, explanatory materials, and a sample email to clients to let them know about this new offering. Learn more and get started with the Advisor Dashboard now.